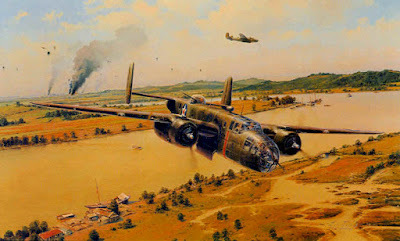 Doolittle Painting from the Official Site of the Doolittle Tokyo Raiders. Used by Permission. Just four months after the Japanese bombed Pearl Harbor, eighty U.S. Airmen, known as the Doolittle Raiders, pulled off a daring attack on Japan. Caught by surprise, the Japanese were unprepared for enemy bombers to strike their homeland, especially in broad daylight. Greater than the damage inflicted, the raid had a psychological impact on the Japanese and their leaders. The military pulled troops and equipment back from the war zones to protect Japan. The raid boosted the morale of the Allies and instilled hope that the enemy was not invincible. Doolittle Raiders Bombing Japan. Used by Permission. For the past seven months I’ve shared the escapades of the Doolittle Raiders’ bombing of Japan and subsequent flight to China where the crews of fifteen of the sixteen planes crash landed or bailed out. By way of a centuries-old communication system, news of the bombing in Japan spread quickly across the Chinese countryside. 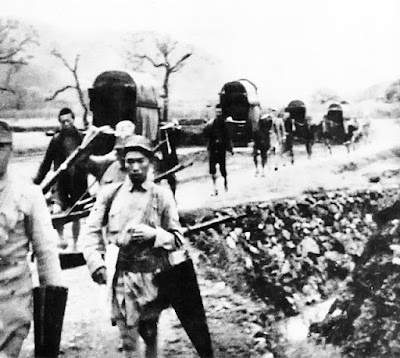 The Japanese had brutally occupied parts of China for many years, and the Chinese rejoiced over the news that their enemy's homeland had finally been attacked. When the "giant" Americans floated down or crashed into their world, the Chinese eagerly escorted the Raiders away from the occupying Japanese forces and to safety far from the coast. Stories about the Doolittle Raiders can be read by clicking on these links: November 2017, December 2017, January 2018, February 2018, March 2018, April 2018, April 2018 (Linda Thompson). The Japanese quickly figured out the areas where the Raiders had landed and sought to capture them. Although most of the crews were spirited away to safety, the survivors from two crews were caught and imprisoned. Linda Thompson tells their story in her April post (link listed above). The Chinese Carry the Doolittle Raiders to Safety. Courtesy of Wikimedia Commons. Public Domain. Because the Chinese aided in the escape of most of the Raiders, the Japanese retaliated with a vengeance. 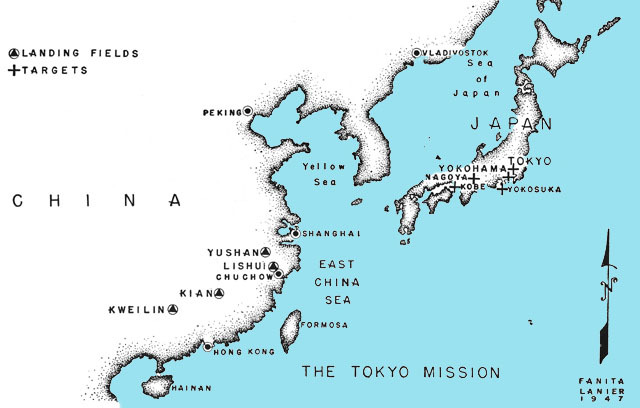 The first order of business was to capture and occupy for one month the areas in China from which air raids could be launched against the Japanese homeland. Japanese Emperor Hirohito ordered his army in China to totally destroy military installations, air fields, and important lines of communication in these places. But the Japanese did so much more. They spent three months wreaking havoc in the Chekiang and Kiangsi Provinces where the Raiders had landed. Eventually the Japanese soldiers spread their vengeance much farther inland, stopping only a few days' march from Chunking, the capital of free China. Many years before, the Japanese had built a three-square mile complex in Manchuria to develop bacteriological warfare. They conducted their experiments on humans they had taken prisoner, including Americans. This clandestine outfit was secretly known as "Unit 731" and employed 3000 scientists, doctors, and technicians. Before the arrival of the Doolittle Raiders, the Japanese had already "turned loose its specially bred fleas and rats to spread bubonic plague among the people of Changde and Ningbo in central China" (Nelson) and had dropped anthrax-bacillus bombs on the town of Anta. In retaliation for the Doolittle Raid, the Japanese "sprayed cholera, typhoid, plague, and dysentery across southeastern China" in June and July of 1942 (Nelson). During one operation, the wind changed at the last minute and seventeen hundred Japanese soldiers died and ten thousand more were injured. It was later learned that the Japanese had planned to spray the Allied forces in the Philippines with a 1000 kilograms of bubonic-plague-infected fleas, but the Allies surrendered first. The Japanese had also planned to attack the U.S. soldiers at Saipan with their "full arsenal of bacteriological weaponry," but the U.S. won the battle quickly and thwarted the Japanese. At the end of the war, the United States captured Unit 731 and continued the research into biological warfare. The Japanese unit chiefs shared "their research findings in exchange for release from prosecution" (Nelson). The U.S. Army built millions of bombs which contained several deadly toxins, but in 1972, "seventy-one nations jointly agreed to outlaw biological warfare, and President Richard Nixon ordered the weapons destroyed" (Nelson). Japan also launched attacks on the U.S. mainland in retaliation for the Doolittle Raid, but that’s a story for another time. 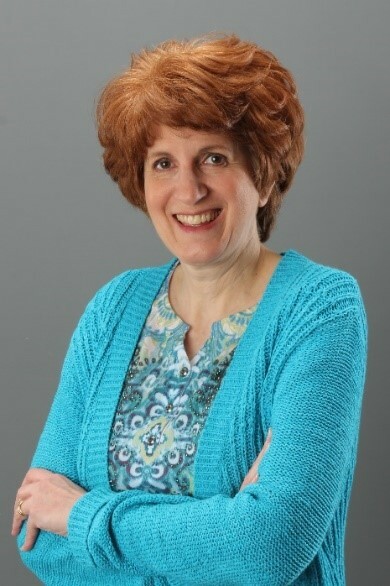 Cindy Stewart, a high school social studies and language arts teacher, church pianist, and inspirational historical fiction author, has semi-finaled in the American Christian Fiction Writer’s Genesis contest and won ACFW’s First Impressions contest in the historical category. Cindy is passionate about revealing God’s handiwork in history. She resides in North Georgia with her college sweetheart and husband of thirty-seven years and near her married daughter, son-in-law, and three adorable grandchildren. She’s currently writing a fiction series set in WWII Europe. This is horrific to read. But thanks to you for your diligent research. Thank you, Connie. I felt this aspect of the Doolittle story needed to be told; however, I didn't share some of the worst details. Interesting but heartbreaking post about the revenge of the Doolittle Raiders on Japan. One day God will have peace among mankind. Amen! One day there will be no more war. In the meantime, Christ promises that all who come to Him will find rest for their souls. Even those who have committed great wrong to mankind can find forgiveness in Him. Dreadful times but I have so enjoyed your posts about the Doolittle Raiders. Thank you for sharing. Thank you, Melanie. There are a few more Doolittle posts coming this summer. Cindy, I had no idea the Japanese had wreaked such havoc on the Chinese for the Doolittle Raiders' rescue. What attrocities! God will avenge those victims some day. Hi, Marilyn. I was shocked too when I uncovered this information in my research. I knew the Chinese had suffered during the occupation but had no idea how much.